How can one automate the outreach process and still have a double-digit conversion rate? Is cold emailing a waste of time? 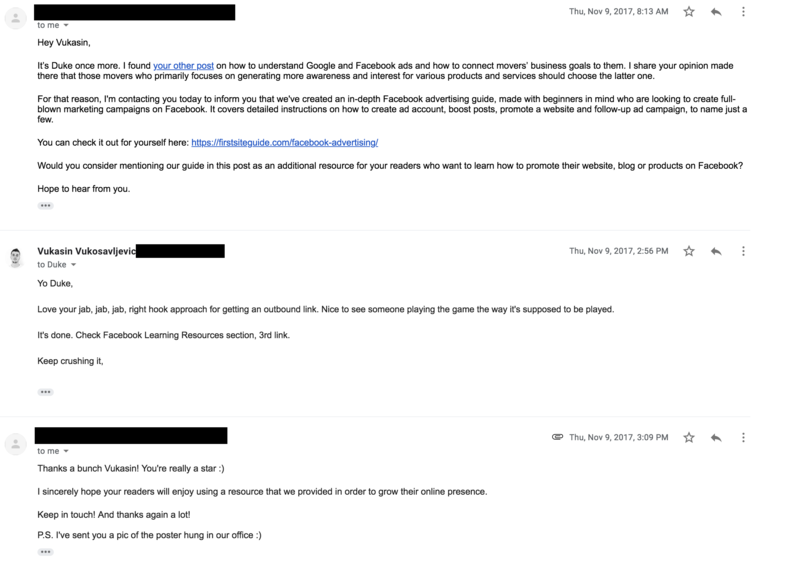 Not only are we automating our templates, but we're also trying to follow the same pattern with prospecting, thus not being to able to scale our outreach in a meaningful and non-spammy way. In the past, I've always had to deal with massive lists of prospects all gathered together under one umbrella named "potential clients". Regardless of our team managing to convert some at the end, it has proven to be a not-so-enjoyable process to be honest. The fact that we're pushing for efficiency and scalability has sacrificed the quality of our messaging. It never felt like the leads are weak for me ... either our approach sucked or they were wrongly selected to begin with. I am a firm believer the outreach starts with doing our homework first - qualifying and assessing leads, so you can boil them down, segment the list and come up with a win-win solution or simply not waste your time on it. I think the challenge number one, before you even start writing emails, thinking about the tempting subject line and all that, is figuring out your target audience. You should pay attention to quite a few things as there are multiple segments within every audience and value propositions tend to vary. If there's a common mistake many businesses make - myself included when I started - we waste a lot of time and resources chasing prospects who won’t convert or contribute to the business growth we're hoping for. The main reasons behind this are either a list of badly selected prospects or our pitch didn’t resonate with them in the first place. Any company that has a website needs SEO to rank well. But that doesn’t mean they are all ideal clients for our SEO agency. Maybe it specializes in e-commerce and doesn’t want to sign startups or newly founded companies. Instead, they want to work on a retainer and pursue low-margin shops with high sales volumes. The SaaS company might want to create a list of prospects who have the decision-making capability within the organization. Specifically, they want to find emails by name and reach out to CEOs, CMOs and Marketing Managers. Our freelancer might want to get in touch with businesses in the fashion industry who lack videos on their Instagram accounts. How can I be of value to them? Can they afford to pay me? Figure out how to make it a win-win. How to better understand your audience? Use all this data for prospecting and to improve your messaging. If needed, segment your audience and create a proposal around that. When you know who your target is, you’re better at chasing it. Would you like ti see an in-depth article about how to better understand your core audience and how to use all these tools? Cold emailing is hard. It just is. Sometimes it works, sometimes it doesn’t. It's a game of testing and iterating. In my opinion, this is by no means a place for perfectionists and people with short-term ROI goals. Let me explain. First of all, email is a saturated channel. It’s overpriced, which means each of us has a tone of messages we receive daily. As a result, it's difficult to make it to the finish line. Secondly, many founders and marketing heads have this tendency to overthink stuff. Is this email signature good enough? Does my email need images? Is there a better verb to use than “get”? This is all irrelevant. It doesn’t matter whether your email is shorter or if it has a few extra lines ... what matters is whether or not you’re providing value. Finally, and I can say I’ve felt this on my skin many times, there's the expectation. Sure, it’s sales where you can’t expect to wait a year to bring in results. But, what I’ve learned is that setting a clear expectation from the start is critical. Wins don’t teach us anything, failures do. The trick is not to make a habit of it. Low open rates and failed conversion attempts help us learn a thing or two to make our outreach better next time. Take your losses with pride. Always test, learn and then double down. Nobody cares if you’re trailing at halftime if you manage to win at the end. Like I said, we’re all very much aware how spam looks like and 9 out of 10 times, we immediately delete these emails. So why bother!? By the way, the blog this person is referring to was oriented towards moving companies and how can they harness their online reputation. 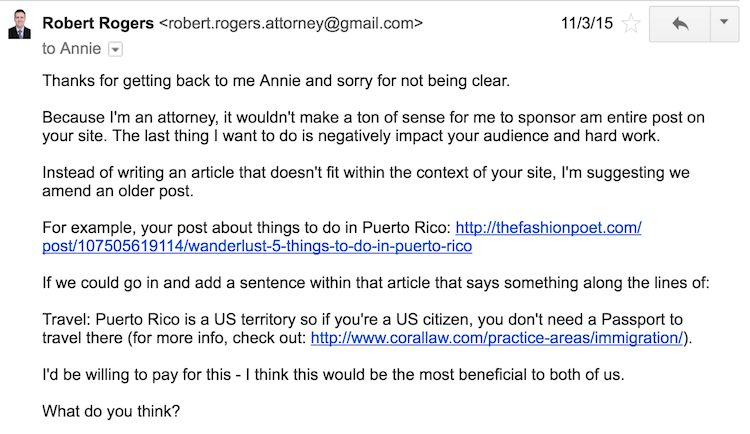 Why in God’s name would they have to realize anything about selling a blog!? I decided to give this generic outreach a chance and I left feeling frustrated. Delete! Do your homework. Otherwise, it’s just not cool. There’s another trap to stay away from. Don’t go for a direct ask. Keep in mind that when you ask, you enter the negotiation from a position of weakness. Nobody cares about what you want. Instead, provide value upfront. Create leverage when none seems to exist. Be able to adapt and figure out how you can give something of interest to your prospect WITHOUT manipulating and asking for something in return … at that stage at least. The answer is, you don’t. Gaining scalability and maintaining quality don’t go hand-in-hand. They’re binary. No matter how tech-savvy your prospect is, automated emails are way too easy to ignore. Full disclosure first. By no means am I saying my strategy is the best. It brought me some good wins and valuable lessons down the road. This is just how I do my outreach and what I've learned from others. But the right approach is the one that works you. So do you. What’s in it for my prospect a.k.a. why should he/she care about my email? How much I know about this person a.k.a. 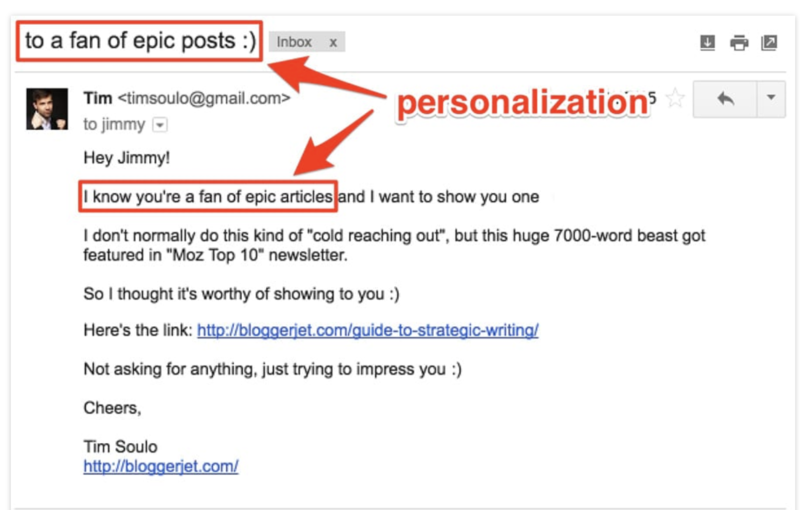 how can I personalize my outreach? Now is a great time to bring back the scale vs. quality trade-off we touched on a few seconds ago. Personalization and providing value will definitely narrow down your audience and make you slower. But if you’re a fan of Gary Vaynerchuk, then you’re all about the macro. But all this doesn’t mean you can’t be fast. The trick is to come up with a process. The climb begins with analyzing your audience thoroughly, after which you can create segments. For example, the SEO agency can divide their prospects into a few different lists: 1) e-commerce prospects, 2) websites with no content and 3) weak YouTube channels in terms of views vs. subscribers. Each of these needs a different, but somewhat similar approach. And here’s the best part. You can add another layer of personalization to the game by using lemlist. Automatically generate personalized images, videos and landing pages to go the extra mile your prospect will value … a lot. That way, you gain scalability and maintain your messaging quality. This is important when you’re making an outreach for the first time. You want to sound human, provide value and show how much you’re worth. But no promotional content. No sales pitches. No asks. 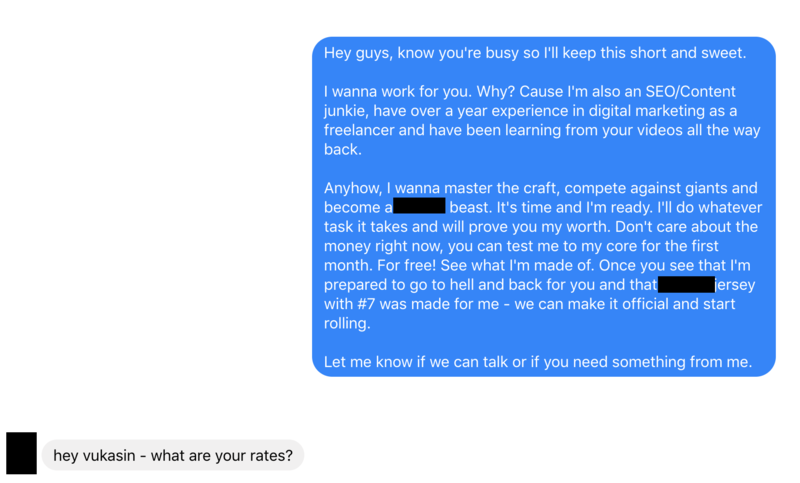 No "please hire me" lines. On all of these projects, I was in charge of the email outreach. Here are some practical things I’ve learned. For SaaS businesses, I prefer to leverage social proof and case studies whenever possible. I always avoid saying “you have a problem” because I don’t want to put them on a defensive. Instead, I highlight a change that’s happening in their industry and try to help them see opportunity in it. Case studies are the proof it actually works after I introduce the change. Where’s the value in it? Well, the case study doesn’t have to be a success story from one of our existing clients on how awesome your software is. Use your tool to solve one of their problems and send them the solution. Pro bono! Zuora did an excellent job with their Sales pitch where you can draw inspiration from. Don’t ask for their business directly. It’s better to tease that part. Imagine it as not just showing them how tasty your cake looks. Give them a bite or two first. Make them want to ask for the entire piece. Make sure you check out how Guillame booked 44 qualified meetings with this kind of hustle. It's mind-blowing, trust me. My favorite outreach because it’s been easy for me to find leverage here. A few variables are included in this pitch: type of job you’re looking for and what do you really desire. Again, everything starts with understanding your audience and what you want to accomplish. Back then, I wanted to fill my free time with more work. I needed to keep my flexibility and complete tasks at my convenience, so it automatically excluded a lot of employers from the list. I was going for startups and small businesses who were in need of creative reinforcements. Since they’re dealing with tight budgets, pressure from both clients and investors, and overall are not that patient group of people, the way you want to position yourself in the outreach is specific. Remember, nobody cares about what you want. Before sending, my final check had to do with the things they have been doing so far. I’d sign up for their trial, play with the product and see how it runs. Do I understand it and believe in it? Next, I wanted to see how they treat people online and what kind of moves are they making. If their business religion is close to mine, I have selected the right prospect. You have to understand, I wasn't in any rush. My income was stable and I had no boss to look over my shoulder. Meaning, I had the luxury of taking the time to reveal my inner Sherlock Holmes. Again, I always try to give first, unconditionally. And even if we start talking about money and my fee, it’s still about them. Don’t get me wrong, I like money. But I’m perfectly fine with investing my time and sweat first, then taking more money afterwards. The logic is simple. Show your worth. Ask for money. Keep proving your ROI on how much somebody pays you. This mindset makes my approach honest. I’m comfortable writing it. Sure, it will sound like B.S. to some, but hey, it saves me time not starting a relationship with businesses I won't enjoy working with. Mutual trust is essential for me, from the start. Results? Reply rate was always quite solid. Whether the response was negative or positive, it was always stronger than 50%. Agree, there are risks, but you know what, when it comes to it, winners win at the end. If there's some extra time to be played, so be it. Finding leverage it’s not always easy. Especially if you’re not your own boss and have clients to impress. Time is the enemy here and you can’t devote a huge chunk of it to build value with everyone. When I was managing a link building project, I have to admit, I observed how the best do it. And for me, those were Webris marketing agency and Ahrefs. I’ve studied their approach carefully and tailored it to fit my needs. How does the concept of leverage work here? You have to have an ace up your sleeve. For example, a strong Twitter account you can leverage to share your prospect’s content and then dropping them a line saying you’re a fan and how you’ve shared this content with your followers. Again, no shallow flattery, go beyond the surface and make sure they immediately get the feeling you’re not faking it. I love how Ryan does it and he has shared some terrific insights here. I’m a huge fan of Tim’s. He didn’t ask for anything and having this content beast on his side turned his outreach into success. You can read more about what Tim has to say about prospecting here. Finally, sometimes an honest approach and steering clear from automated templates can be enough to get things done. Webris and their founder Ryan Stewart have mastered this. Learn more about their outreach tactics here. What to do if you don’t have a strong Twitter or solid social proof? Well, to quote Frank Underwood: “If you don't like how the table is set, turn around the table”. Check if there are any broken links on their website or in their articles. Assess their daily activity on Social Media and see if there’s an opportunity there. Analyze their frequency of publishing content. Read some articles and make sure there's no outdated content. We all need something. You either have the leverage and come from the position of strength, or you’re asking and come in weak. 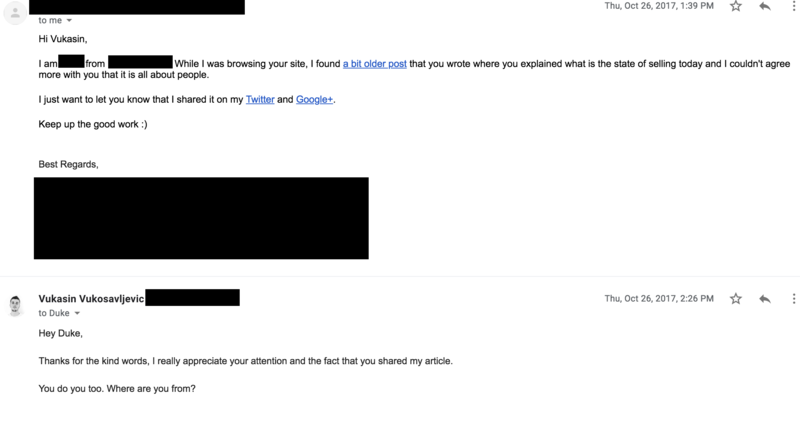 Cold outreach is not dead, bad emails are. Figure out how you can be of value to me and go the extra mile. 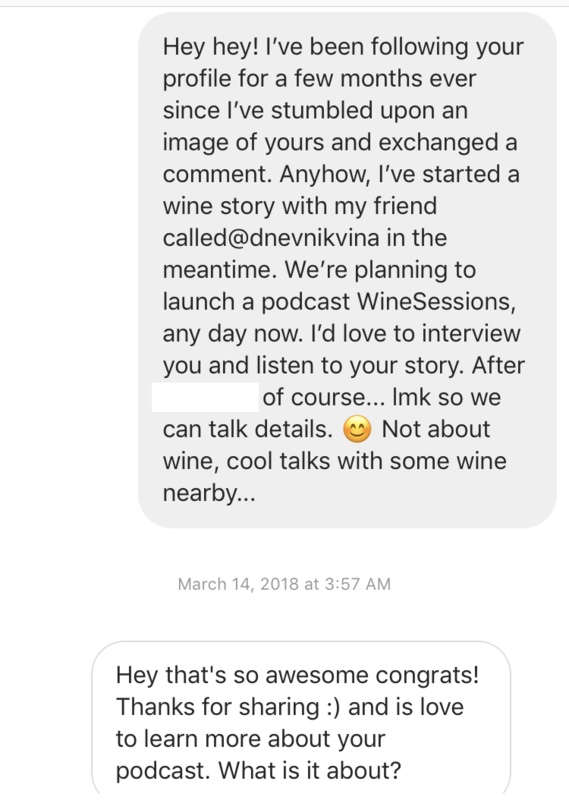 Sometimes it will work, sometimes won’t, but it’s sure as the blue sky that it pays better dividends than using automated templates, asking on the first transaction and writing fake B.S. P.S. If you want to do some serious personalization at scale and test drive this approach, come sign up for a free trial on lemlist. It's free, no CC required, test it and see what happens.